(1) In the European Theater, additional truck companies were attached to the Transportation Bn that was organic to Div Trains. (2) According to doctrine for the period, the Administration Company should have been organic to Division Trains. However, some sources indicate that the 3rd Admin Co was a separate company under HQ 3rd Inf Div. Can anyone provide details? As part of the reorganization of the 3rd Infantry Division under the ROAD concept, Division Trains was converted to a support command. The new Division Support Command (DISCOM) embodied a headquarters and headquarters company, an administration company (see footnote #1 below), a division band, and medical, supply and transport, and maintenance battalions. The organization of 3rd Div Support Command is presented below, with information as of 1965. (1) According to doctrine for the period (FM 54-2, 1961 and 1965), the Administration Company should have been organic to Division Support Command. However, some sources I have for the 1967-68 period, indicate that the 8th Admin Co was a separate company under HQ 8th Inf Div. Can anyone provide details? 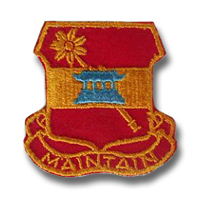 Constituted 1 July 1957 in the Regular Army Headquarters and Headquarters Detachment, 3D Infantry Division Trains, and activated at Fort Benning, Georgia. Consolidated 20 March 1963 with the 3D Infantry Division Band (organized in 1943 as the Band, 3d Infantry Division) and consolidated unit reorganized and redesignated as Headquarters, Headquarters and Band, 3D Infantry Division Support Command. 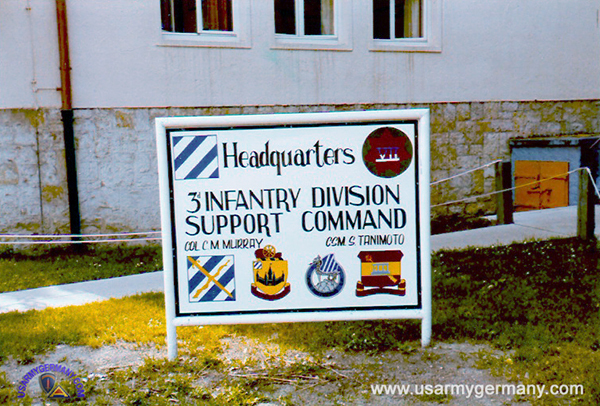 Reorganized and redesignated 15 March 1968 as Headquarters and Headquarters Company, and Band, 3D Infantry Division Support Command. 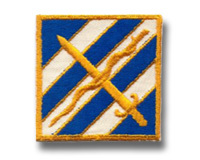 Reorganized and redesignated 21 May 1972 as Headquarters and Headquarters Company, 3D Infantry Division Support Command (Band concurrently withdrawn - hereafter separate lineage). 218th Ord Det (RKT MSL SP) Giebelstadt Air Base added? 3rd Inf Div Band Wuerzburg . Article by Larry D. Byerly. Sr.
Change, to some, is too stressful to live with. To 3rd Infantry Division soldiers, it's a way of life. The Army of Excellence (AOE) concept has brought about many changes in the Marne Division. 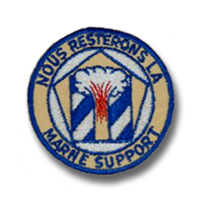 The most recent being the activation of the main support battalion (MSB). According to CSM Donald L. Knight, 703rd Maintenance Battalion, the 3rd Medical Battalion and 3rd Supply and Transport Battalion will merge with the 703rd Maintenance Battalion, to form the MSB. The MSB is comprised of soldiers from three separate battalions, but it will result in a reduction of personnel compared to the number now authorized for the 703rd Maintenance Battalion, according to battalion officials. Knight explained that soldiers in any battalion-sized unit have a strong family bond which comes from knowing the job of the other person. "We've been studying and working with the medical personnel so we can have an understanding of their entire mission, and want them to feel like part of the family here," he said. "We are aware of the delicacy of this challenge," said Knight. Knight, former command sergeant major of 3rd S&T, believes the transition of the supply battalion will go rather smoothly because of his experience in the field. An activation ceremony on May 16 at Leighton Barracks marke the blrth of the MSB. After the activation, the MSB commander, Lt. Col. Frederick R. Hoose, ordered the battalion's first organizational day to begin. According to Knight, the organizational day gave the family members an opportunity to experience a feeling of acceptance that will be crucial to them in the early days of their new unit. Aside from moving a lot of furniture and equipment, the soldiers won't notice a big change in their day-to-day lives, according to Knight. He said the big change in personnel will be among the leadership roles. "Some of the staff will see as much as a 20 percent cut from their manpower authorization," he said. The companies of the medical and supply and transport battalions will become members of the main and forward support battalions. The main support battalion will be the rear support element for the forward battalions. According to Sirois, the FSBs have no casualty holding capabilities. Only the MSB has the equipment and personnel required for holding wounded soldiers. 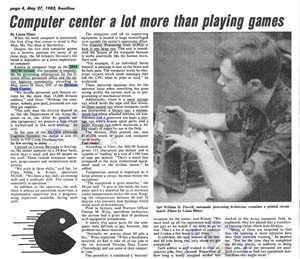 Article describes the 3rd Inf Div Data Center and its IBM 360/40 computer at Larson Barracks, Kitzingen. 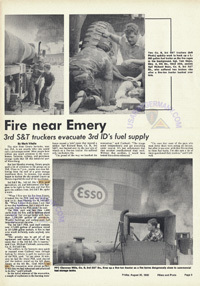 Article describes efforts by soldiers at Emery Barracks to move 5,000-gallon tank semi-trailers from the B Co, 3rd S&T Bn Class III Yard away from a raging fire at Zell am Hafen near the installation. B Company has 23 5,000-gal. tank semi-trailers with 115,000 gallons of fuel parked at the Class III Yard. That fuel is the 3rd Inf Div's reserve. In late 1970, I rotated from 2d Logistical Command, Okinawa back to service in NATO. I had already spent a pleasant tour in Kaiserslautern 2 ½ years earlier and tried to divert from my assignment to one there. I asked the personnel specialist for assignment to my old unit in the USAREUR Augmentation Readiness Group but was out of luck. I found many years later that the organization had undergone yet another of its name changes, this time to Combat Equipment Group Europe. I was not looking forward to service in the 3rd Infantry Division. Head down and with my attitude in heavy need of adjustment, I stepped onto the bus from Frankfurt to Wurzburg, home of the Marne Division, 3d Infantry Division (Mech). After finding the transient barracks and the 3d Admin Company, I turned in my records and waited for further assignment orders, orientation and a ride to my new home. Restricted to barracks and the mess hall, we were allowed to view “To Hell and Back” on a continuous loop. I can still sing the song, Dog Face Soldier, with little prompting. With thanks to an efficient personnel clerk, the next morning I was in a sedan on my way to my new unit, Headquarters and Company A, 703d Maintenance Battalion, a short hop down the autobahn, in Kitzingen. Upon reaching my new unit, I found they didn’t know what to do with me. There was no slot in my MOS and I was actually excess in any supply MOS. I didn’t exist in the Division, let alone the battalion. 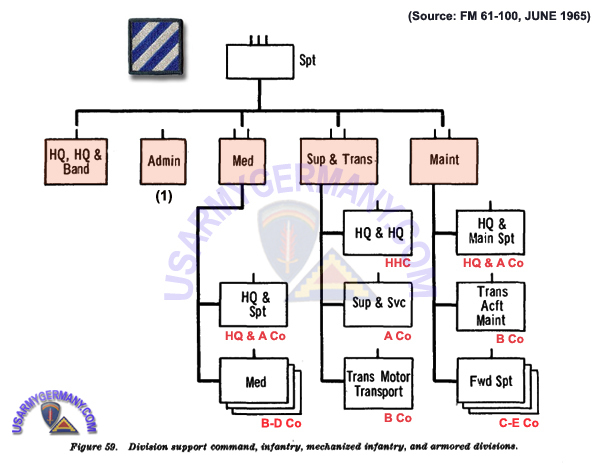 My MOS was a General Support or depot level one. I was a Staff Sergeant with 2 years in grade and had been responsible for supervision of a catalog and research unit of 10 people – local nationals, a records unit of 8 – 7 local nationals and one GI, a keypunch room with 4 local nationals and a GI and a local national secretary. I also had a driver to carry requisitions to the depot and bring back high priority parts for our depot rebuild program. My experience was with supervision of 20 to 30 people and working with both automated and manual stock records. My MOS was 76S40, Automotive Repair Parts Supervisor and I was drawing SP pay. I guess they saw the 76 and put me in S4. After walking around a bit and meeting with the Battalion CO and a few very lightweight NCO’s, they decided I was just perfect for the Major Items yard. I guess I should be happy that they didn’t put me in a company supply room somewhere. Let me describe this place. Larson Barracks is on a hill overlooking the city of Kitzingen. Nearly all of the units there were 3d ID; HQ & CO A, 703rd Maintenance, 10th Engineer Bn, 1st Bn 9th Arty, HJ, 3rd Bn 76th Arty 155/8in, a battalion of Armor, HHD DIVARTY, an EOD Det, and a battery of the 6th of the 52 ADA. The location is lovely and we were really away from any sort of city. Rumor has it that the post was constructed during or at the end of WWI and was originally a hospital for gas patients. At least that is the story we were told. Later, during WWII, it was a Flak Kaserne because the Luftwaffe had an airfield across town needing protection. I was assigned to the Major Item Yard. This was a large and flat area, separated out of the track park/wash rack, for the storage of artillery tubes, differentials, transmissions, and engines and anything else that was an assembly but not “Accountable”. Most of the surface was dirt or gravel with a concrete pad at the wash rack and from gate to gate in a large “U”. Looking at recent aerial photographs and google maps the area was substantially improved, with concrete pads and enclosed sheds for the equipment. Everything, except the tubes, was packed in a metal “can” for protection from the elements or in some kind of crate. My office was a Code H shelter from the back of a ¾ ton with a potbelly stove. Fuel can was on the roof of the shelter and fed the heater with a rubber hose. To get refueled I had to walk down to the POL point and tell the guy there to have the tanker refuel me (no shutoff on the tank). That could take minutes or weeks, depending upon the mood he was in. When the heater had fuel and was working it was quite comfortable. The main support battalion, that is HQ & Co A was a semi-mobile unit. We had no organic vehicles to move material around or to store it. We had a 3rd Echelon shop for heavy maintenance along with fuel and electrical rebuild and parts storage. I think they had enough basic trucks to move the trucks out but the repair parts and assemblies would have to stay behind. There were no shop vans or repair parts vans and the data processing vans were rumored to break, if they were moved. So, if there was an alert, we stayed put. I went to my shed and sat there until all clear. Probably the only good thing about being in the outfit. Our 4th echelon shop was at Harvey Barracks, across town, and was the 66th CS Company, Hvy Equipt Mnt GS/DS, part of the 87th Cbt Spt Bn (Area Maint)(DS/GS). 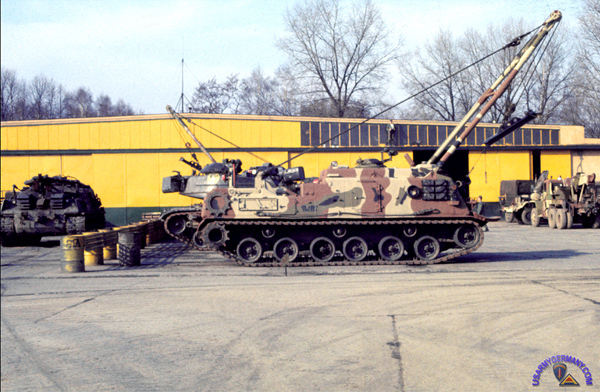 Our yard provided serviceable major items to the Division’s Forward Support battalions. Everything was on an exchange basis, like for like. If we didn’t have it, we had to go to a depot or maintenance plant with the unserviceable part, exchange it for a serviceable one, and give that one to the unit. We still didn’t have a part to exchange for the next time one was needed. The yard itself was equipped with a 6,000 lb commercial forklift and a 20 ton rough terrain crane. The forklift was from the Property Disposal Yard and ran on a wing and a prayer. We couldn’t get parts for it because it didn’t exist, as far as the Army was concerned. Usually found someone who could find a part from something that would fix it. It had a motor from a ¾ ton M37B1 and the electrical was converted to 12 volts to fit everything else. The crane belonged to the 10th Engineers and was used for lifted track power packs, weighed about 6 tons, into trailers or deuce and a half’s. Yes, I know, it was overloaded. But, when the Colonel says to load it that way, you are kind of disposed to do so. The supply platoon did have a 10,000 lb Rough Terrain forklift, but it was assigned to the repair parts warehouse and the warrant officer in charge wouldn’t let it out of his hands except on orders from the battalion commander. We could ship 24 hours a day, 7 days a week. I was on call to fire up the forklift and load what needed to be loaded. Typical Army, an E6 doing an E3’s job. I was drawing SP Pay to boot. Hardest things to load were the gun tubes. The 175mm tubes were long and awkwardly balanced. Almost all of the weight was within a ¼ of the length of the tube, nearest the breach. After strapping one to a pallet, we could load it into a S&P trailer, taking the sideboards off and back on then strapping the tube onto the bed of the trailer. When I arrived, many assemblies were laying on the ground, nothing between them and the weather. I got some help and some dunnage and got them up off the ground. Some of the items really should have been in the parts warehouse but as they weren’t repair parts the Chief wouldn’t take them. My predecesor had been a SP5 who was rather lazy and preferred to spend his time in the office sucking up to the S4. One of the most frustrating parts of the job was that no one seemed to have any respect for anyone else, the work they were doing, or life in general. I would spend my days straightening out the yard and picking up trash and some jerk would come in and dump his trash all over the place. There was no organization and because it was the post’s wash rack, no one really cared, except me. Much could have been done to improve things with a little cooperation? Like how about a trash bin or two? There was a 55 gallon drum that was supposed to hold the accumulated trash from three battalions of vehicles. It was emptied once a month, I think. I met and associated with a number of interesting people during my thankfully brief stay. Some in my unit and others in the ADM platoon of the 10th Engineers. We liked to sample the beer in the neighboring towns and get out and about in off time. Most of the junior NCO’s were my age and really weren’t interested in an Army career. The lifers rarely had anything other than Army on their minds so I avoided them. We drove to Nurnberg and Wurzburg and visited the sights. One interesting thing about my assignment was running into a sergeant from my Kaiserslautern assignment. He was a tall skinny guy who had a lifetime in grade at E6. He had just been promoted to E7 and was celebrating at our NCO club. He was on a VII Corps inspection team, visiting units in the area. Had a nice conversation and hoped I would never wind up like him. He was good at his job but had little going for him otherwise. Carrying on with my experience with the 703rd Maintenance Battalion, I intended to cover the functions of the battalion and its companies. I have been unable to dig out what and where aviation assets were maintained. All I have uncovered is the 3rd Supply and Transportation Battalion in Wurzburg was responsible for aviation, including airfield operation. Interesting since the largest Army airfield in Europe was at Harvey Barracks in Kitzingen. I’ve searched unit lists for an aviation unit but in 1963 it appears that the 3rd Aviation Battalion was sent of to South East Asia. There were certainly rotary and fixed wings assets for DivArty, Cav and Command and Control but where they were assigned I don’t know. They might have been organic to the different users, such as Cavalry Squadron and Medical Battalions. I’ll leave it at that. 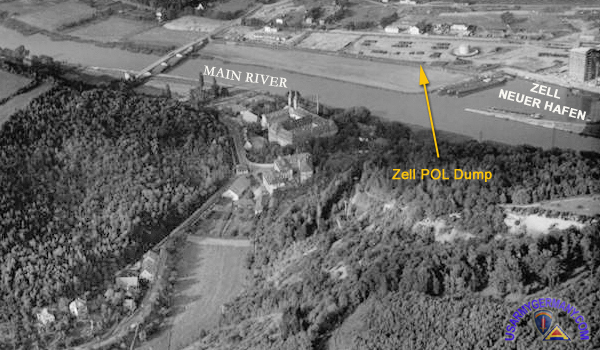 Division headquarters, along with 3d Admin Co, 3rd MP Co, 3rd MI Co, 3rd S&T Bn, and 123rd Signal Battalion were located at casernes around Wurzburg and the 7th Bn, 67 ADA Vulcan Chaparral located at Giebelstadt. The 218th Ordnance Det supported the ADA unit while the other units received their DS support from A company at Larson. Each of the forward support companies had a similar job. They provided ordnance DS maintenance for their supported battalions/brigades. 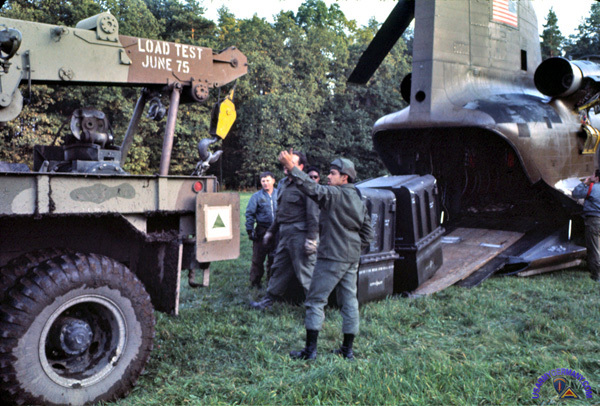 If the local battalion or company maintenance could not make the repair for lack of parts or expertise, or because it was echelon above maintenance, it was evacuated to the supporting Forward Support Company. Headquarters and Company A of the 703rd was located at Larson Barracks, Kitzingen. It provided heavy support to the Forward Support Companies (FSC) along with HQ DIVARTY, 10th Engineers, 1/9th Arty HJ, & 3/76 FA 8inch. 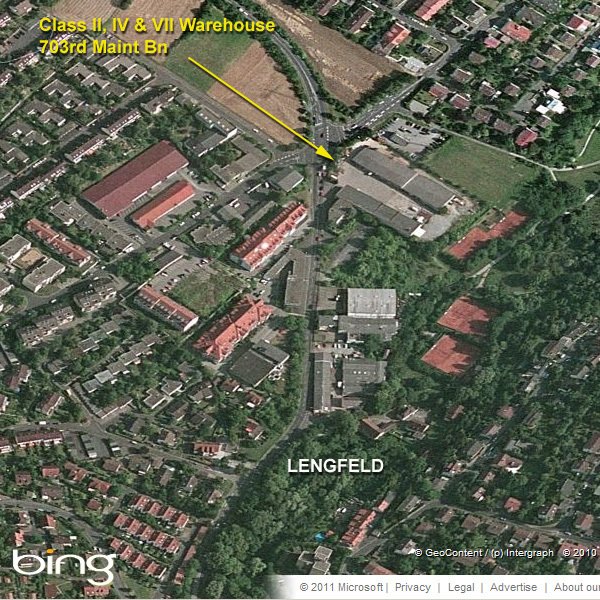 Company B was located at Harvey Barracks, Kitzingen, and a few kilometers across town from Larson Barracks. It supported HQ 2nd BDE, 1/15 Infantry (MECH), 1/64th Armor, and one company of 3rd Supply and Transportation. Company C and Company D were on Ledward Barracks, Schweinfurt and supported HQ 1st Brigade, 3rd Medical Battalion, 3/7th Armored Cavalry Regiment, 1/7th Infantry Bn, One company of 10th Engineers, 1/10 FA 155mm, 1/30th and 2/30th Infantry Bn’s, 2/64th and 3/64th Armor and the 2/15th Infantry Battalion at Wildflecken. Schweinfurt had units at Ledward Barracks, Conn Barracks and there was a forward battalion, 1/15th Infantry Mech, at Wildflecken. Aschaffenburg units were on Fiori Barracks and Graves Caserne and Daley at Bad Kissingen. The main differences between the companies were the mix of equipment supported. All depended on Main Support in Kitzingen for those things they couldn’t handle, along with local DS/GS units for heavy maintenance. 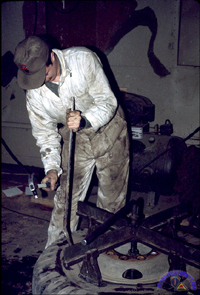 VII COSCOM’s 66th Heavy Equipment Maintenance Co at Harvey Barracks provided general support for parts and maintenance. The 703rd Maintenance Battalion (along with 4th Armd Div's 126th Maint Bn) has begun to test a new concept called Direct Delivery under which the Army plans to supply troops overseas faster and more cheeply. During the three-month pilot program, direct support supply units will order parts through the US Army Material Command, Europe (MATCOM), but shipments will be sent straight from warehouses in the US to the ordering units, bypassing theater supply depots. With this new concept the Army expects to speed deliveries and cut costs by reducing unneccessary handling, limiting stocks of low-demand items in the depots and, ultimately, removing them from the supply line completely. The goal is to cut resupply time from the current 180 days to 35 days (by ship), and even less when items are sent high-priority (by airplane). The first delivery of parts (four tons of supplies boxed and packaged in a container) arrived at the 703rd on Aug. 11, just 20 days after unit supply clerks submitted the requisition. The 126th received two such packages on Aug 12. Thanks for expressing interest in my photos. I was drafted in June of 1972. Did Basic at Ft Dix and was trained as a mechanic (63H) at Aberdeen Proving Ground. My original overseas orders were for Vietnam but after a week at the Replacement Station most of us were diverted to Germany. I was assigned to Delta Company, 703rd Maintenance Battalion at Conn Barracks in Schweinfurt first as a mechanic until "The Old Man" discovered I had a college degree and he requested that I be made an Admin clerk. In spite of all the craziness, Schweinfurt was good duty and I got to do a lot of traveling throughout Europe. I actually extended for a year which everyone else thought was nuts. All of the photos were scanned from my original slides and, in retrospect, I wish I had taken more. Article describes renovations made to the Class IX (Repair Parts) Warehouse of the Hq & A Co, 703rd Maint Bn at Larson Barracks. 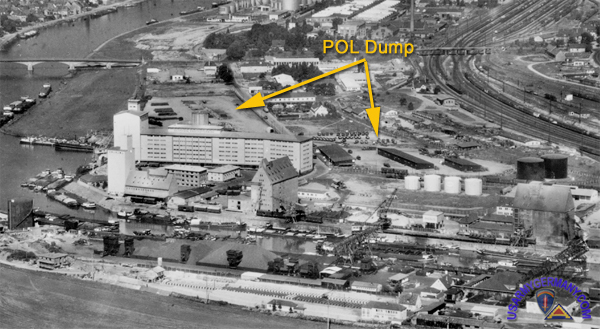 Can someone provide photos of the warehouse and activities during the time the complex was used by the 703rd Maint Bn (or any other Army unit prior to that)? For the fourth time in 11 years the 63rd Transportation Aircraft Maintenance Company, formerly Company D, 3rd Aviation Battalion (Combat), will receive the USAREUR Aviation Support Unit of the Year. The 180-soldier-strong 63rd TAMC provides intermediate aircraft support for more than 140 of the division's aircraft. "We work very hard here," said Maj. Randolph Weimer, commander. "We do precise and highly skilled work with some very expensive equipment and I feel the soldiers deserve this award." 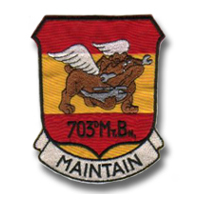 The 63rd completed a record number of aircraft recoveries during 1984. A total of 15 recoveries were made, many from isolated field locations. Two of the more noteworthy were the engine replacement in a Cobra, accomplished on a range at Grafenwoehr in eight hours from the time the aircraft reported the problem to the time it was back in the air, and the successful aerial recovery of an observation helicopter with a Blackhawk. Both were done during poor weather conditions. "Another reason we received this award was our spectacular movement to the field during REFORGER 1984," Wehner said. "We moved our equipment to the field by rail, convoy or aircraft, without a single mishap. Within six hours of arrival at our field site, we were operational," he said. Sp4 Philip W. Pegalow, hydraulic repairman and shop foreman, said he and his two-man crew work very long hours. "The commander told us about the award this morning and I think it means we do something right," Pegalow said. PFC Pierre M. Cochran, hydraulic repairman, said he just came from an outstanding unit where they won a similar award. "I just do my job and let everyone else take the credit," he said. "I guess I'm used to receiving awards like this." Sgt. Raul Andino, engine shop mechanic, said even though they won the award for their hard work, there could be improvements in working conditions. "We do better work than our competitors, as shown by the award, but we could do better if we had a hoist for the engines and could get parts faster," he said. Some soldiers, however, said they were not excited by the news of the award. A few of the unit members thought the award did not properly recognize the soldier on the line. Wemer countered, "After REFORGER, a good many soldiers received Army Achievement medals. "True, the soldiers work harder here than in other companies, but that is because a helicopter can't just pull to the side of the road if something goes wrong like a truck can. "And when I accept the award on behalf of the company, I'll take ten soldiers along with me. Yes, I'm glad we won the award, but the soldiers are the ones who work for it, alongside the officers and NCOs. It's the entire company's award." The 63rd TAMC competed against seven other units for the award, three of them battalion-sized. Some considerations for the award included completing 1,600 work orders with 30,000 man-hours expended during 1984. Others were the 20,000 accidentfree miles compiled by 63rd's drivers during REFORGER and providing 24-hour on-call maintenance while at the same time guarding a bridge. Weimer said the 63rd TAMC became a part of the Division Suooort Command on March 16. Ieaving behind their motto "Delta Dogs" and picking up the motto "We are Winners."